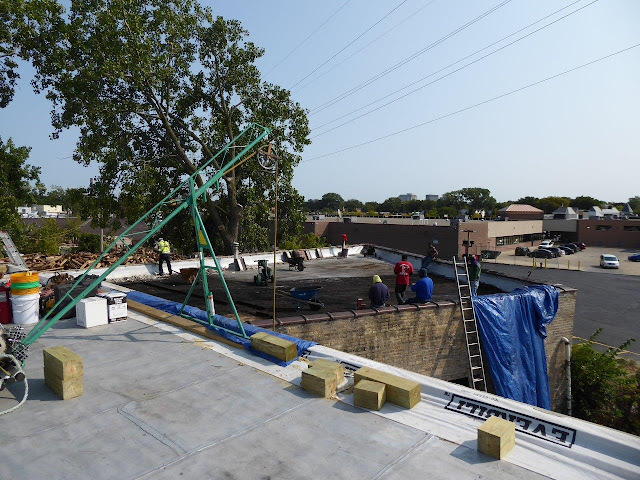 ROOFING work is 99% complete. 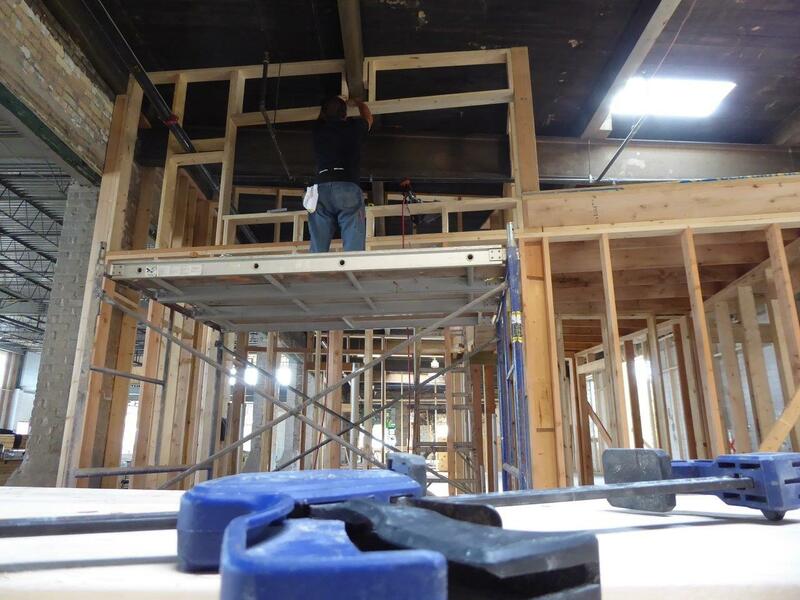 Flashing the mechanical trades penetrations to follow once those trades (PLUMBING, HVAC & ELECTRICAL) are finished. 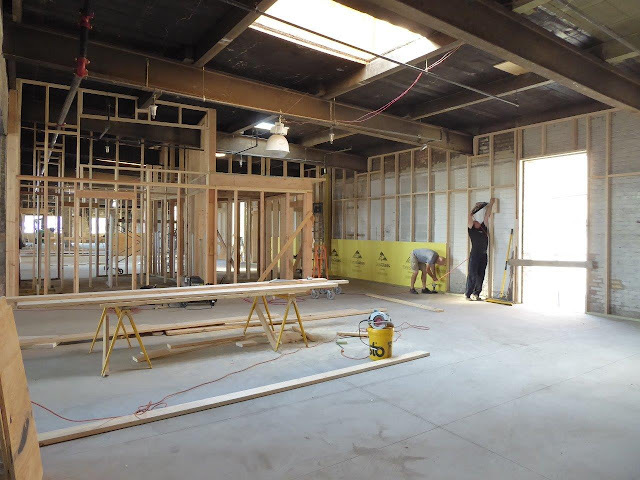 The CARPENTERS have been alternating between framing interior partitions, EIFS and roofing related work. They keep the project “humming”. 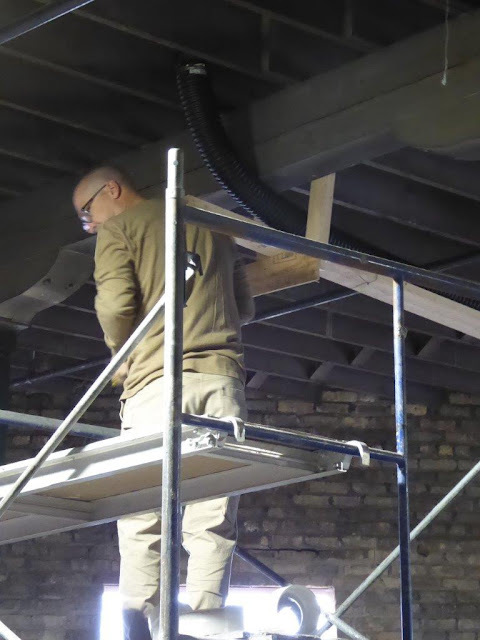 The PLUMBERS are back on the job installing above grade waste/vent piping. The MASON contractor has also returned infilling various openings that needed to wait. 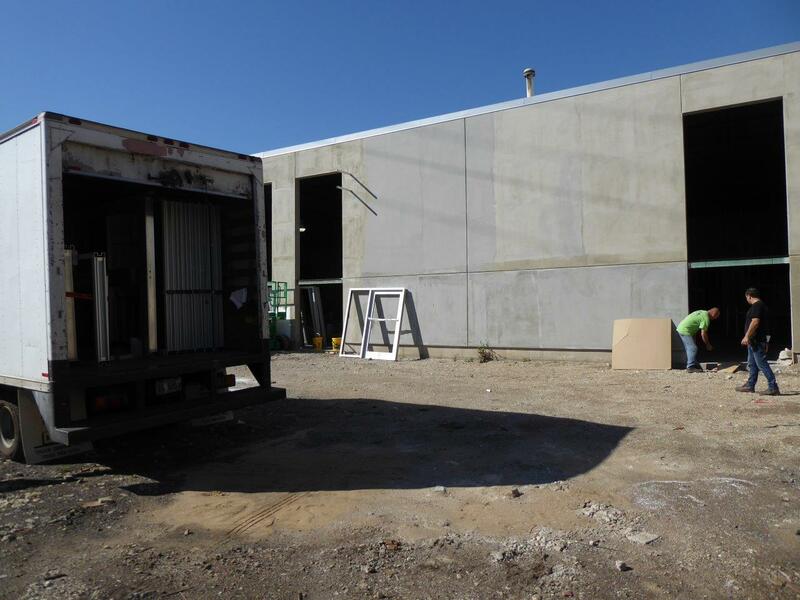 Additionally, the HVAC and WINDOW contractors are now on site. 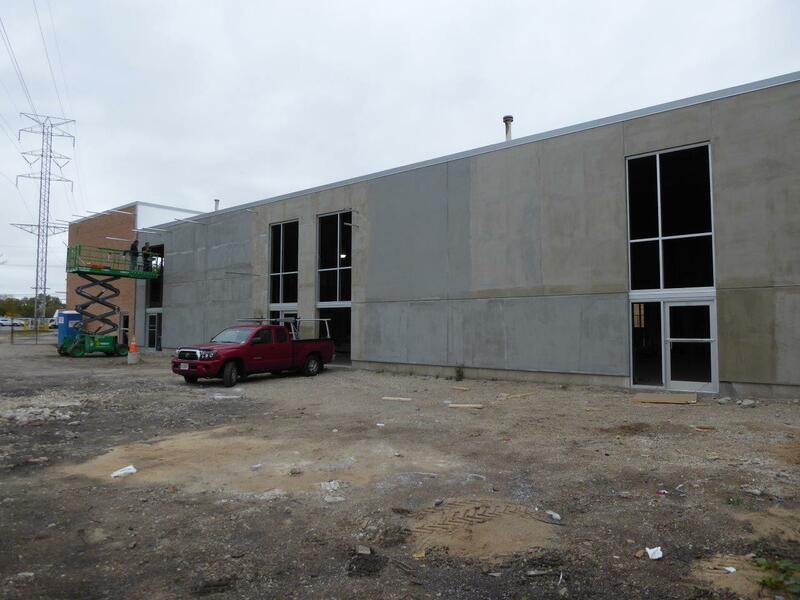 Per Matt’s schedule, we should be 100% enclosed in the next 2 weeks. 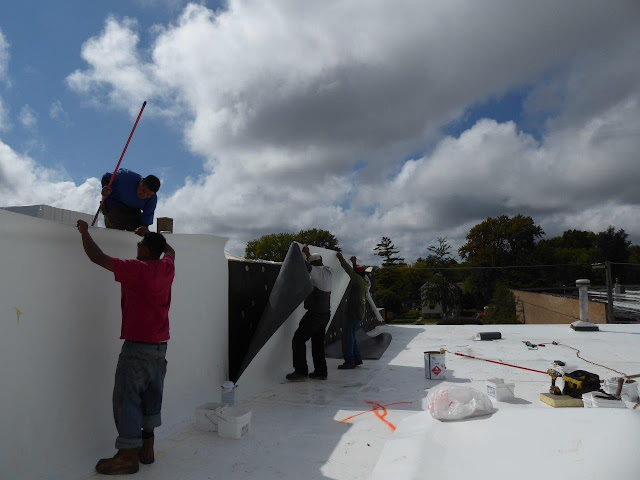 NEXT…SKYLIGHT installation…PLUMBING, HVAC, WINDOWS & CAPRENTRY continue...lots of activity. 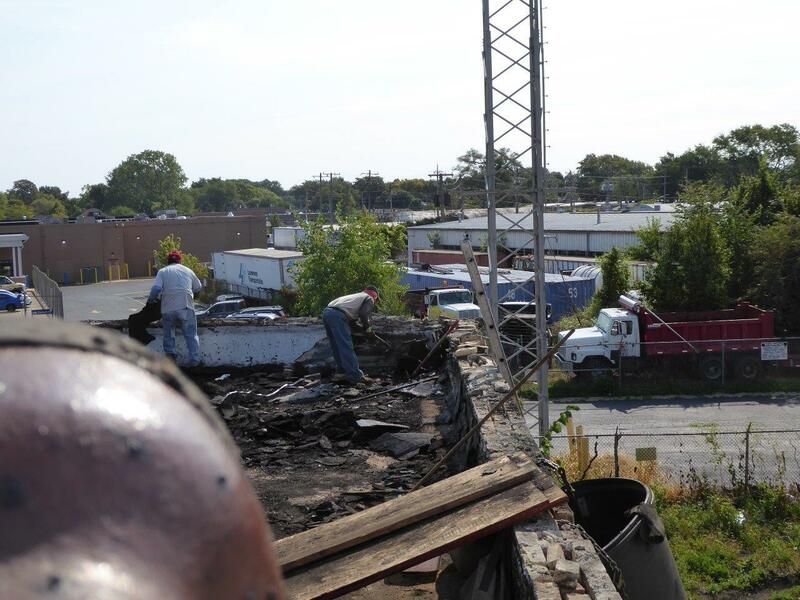 ROOFING: 4 buildings/roofs make up this project. The one in the background needed a "tear off" whereas the others did not. 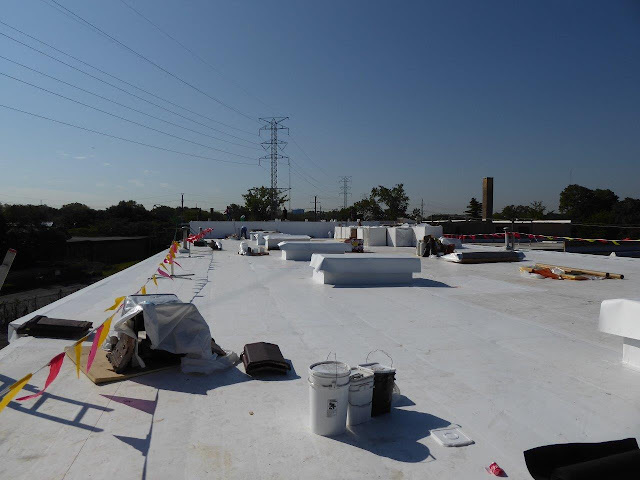 Each roof received a 4.5" polyiso insulation system which was mechanically adhered and glued to the existing substrate. 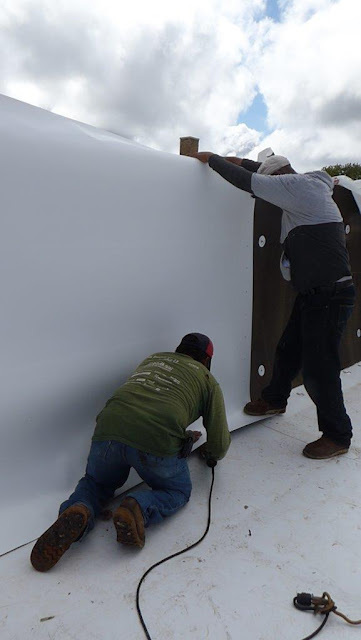 The new waterproof TPO (thermoplastic olefin) membrane is glued to the insulation using a waterproof contact cement system (insulation & membrane both receive glue). 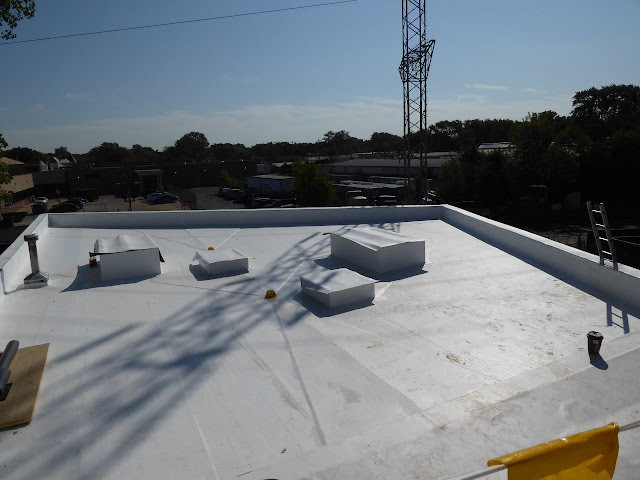 The white color reflects the sunlight reducing thermal shock to the system. 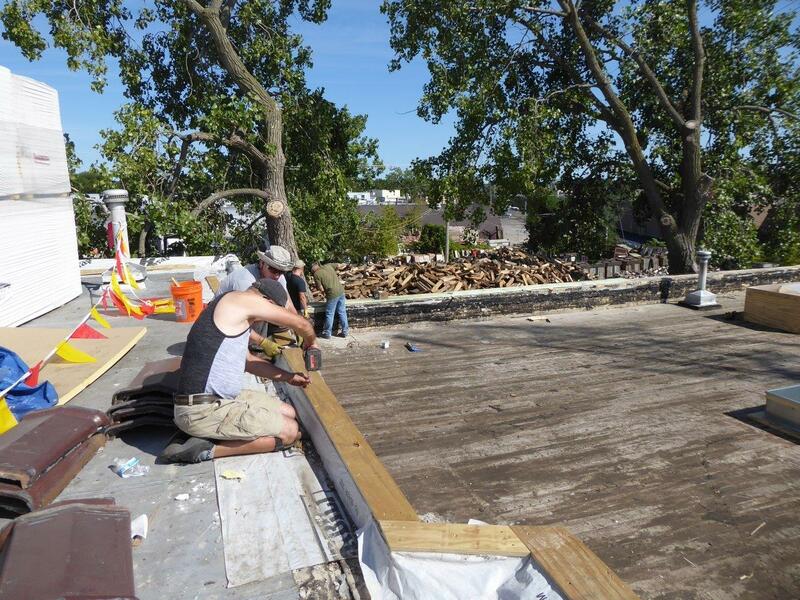 ROOFING: The "tear off" involves sawcutting several roofs into manageable sections. ROOFING: the parapets are also a mess with the top courses of brick needing rebuilding. 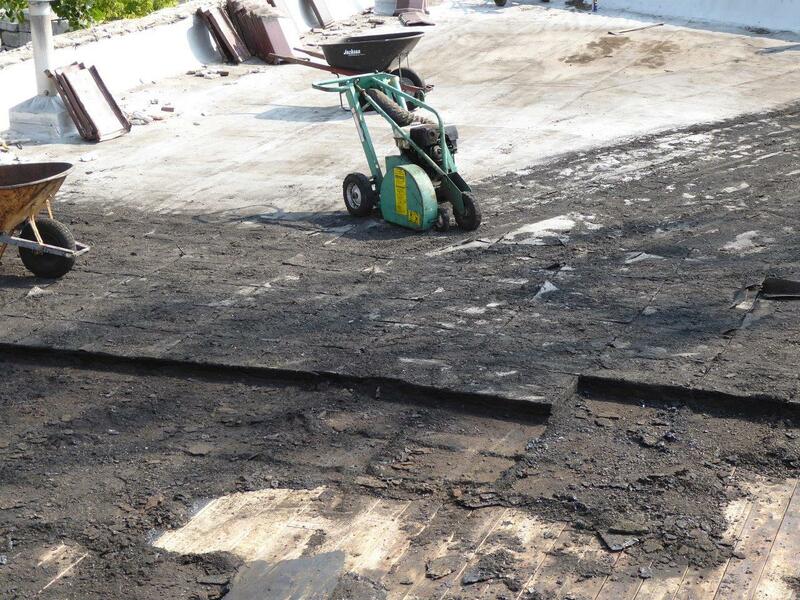 ROOFING: tedious and heavy work. ROOFING: Simultaneously with the tear off, insulation & membrane have been stocked. 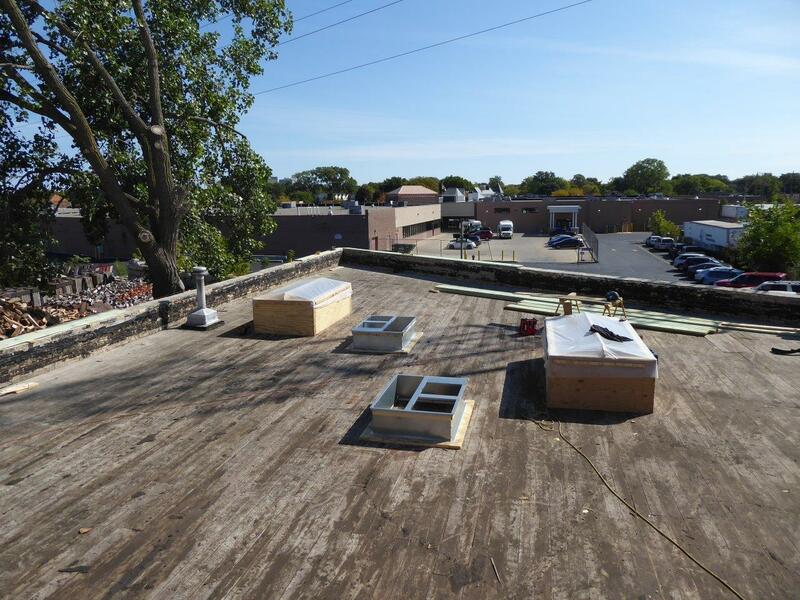 the 2 plastic covered raised boxes will receive skylights. 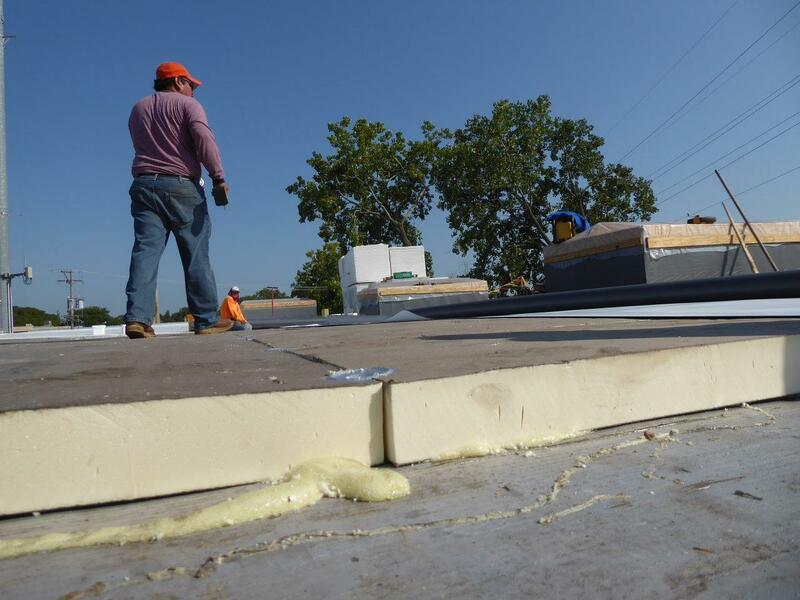 ROOFING: insulation has been installed and the TPO membrane has been laid out for gluing, only enough insulation is installed that can be roofed in a single day as not to get saturated by rain. 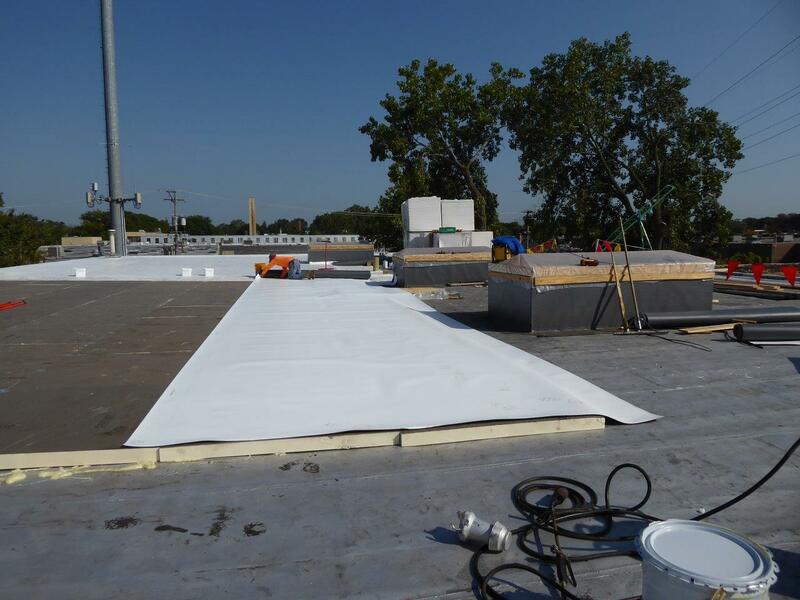 ROOFING: insulation installed, membrane in process. ROOFING: a 2-part epoxy system adheres the insulation to the substrate. 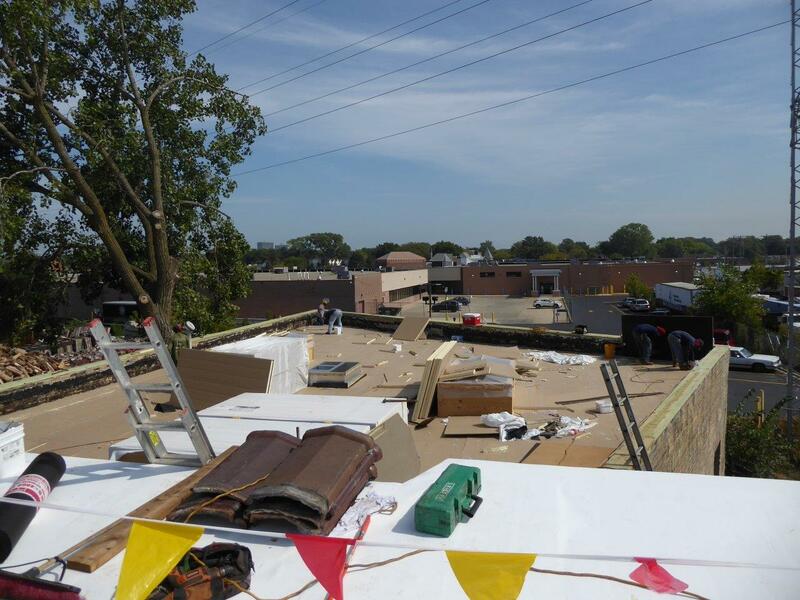 ROOFING: the back side of the TPO is being glued. CARPENTRY: 2x12 treated wood caps the repaired masonry parapet walls. 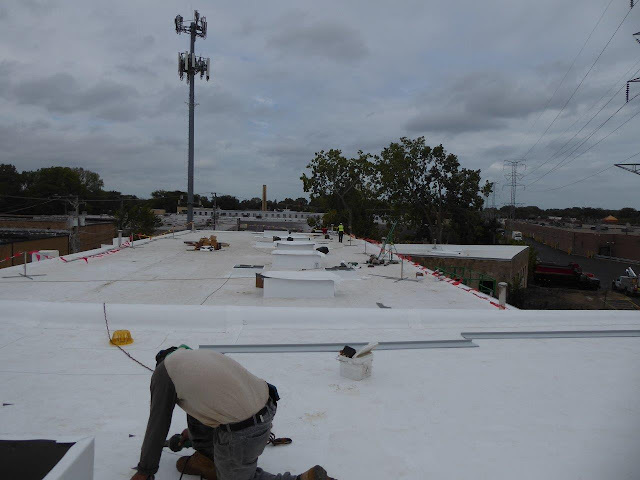 an aluminum flashing system will be installed to finish the tops. 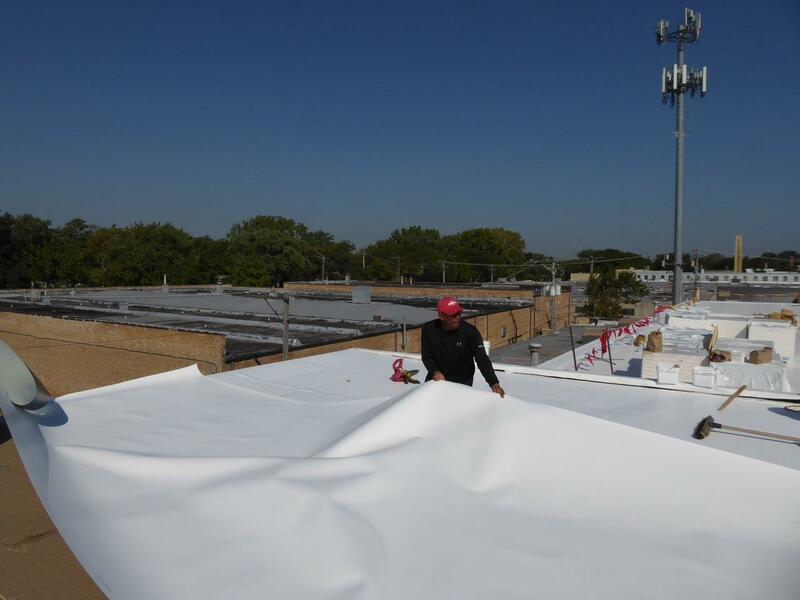 ROOFING: "tear off" complete. 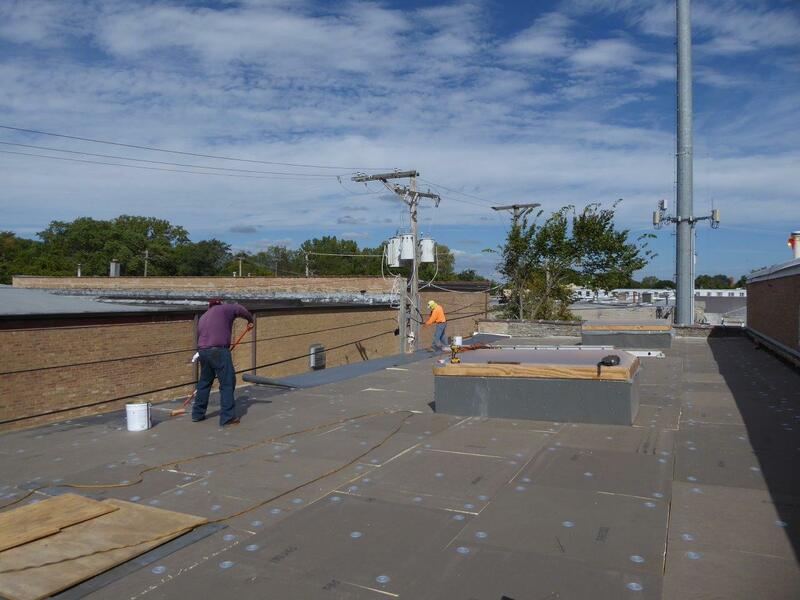 HVAC rooftop curbs have been installed...insulation/roofing to follow. 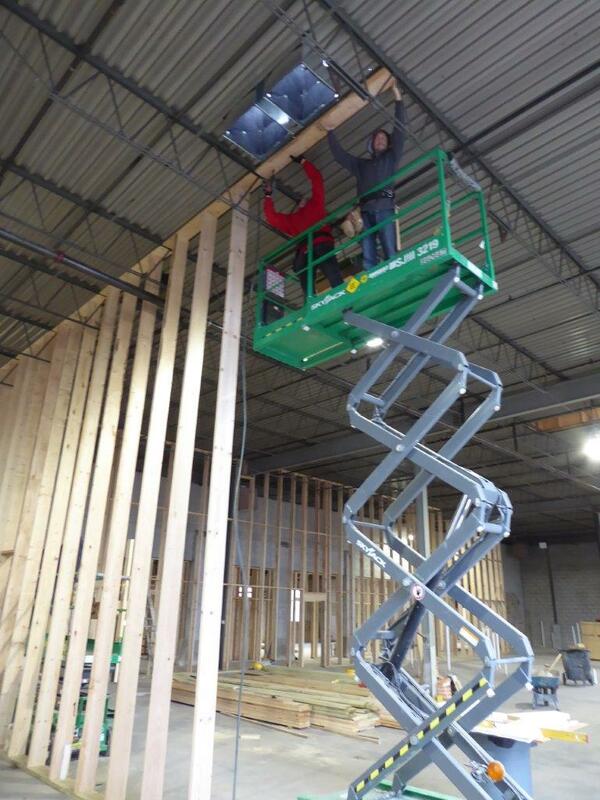 ROOFING: the 6' wall at this building intersection has been insulated...membrane gluing in process. FYI, the orange "X" is a cut out below so DON'T step there! 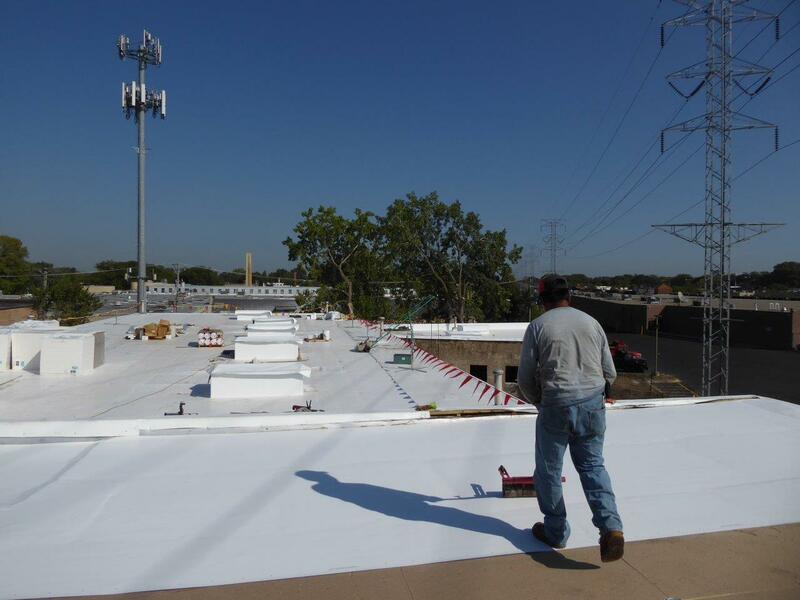 ROOFING: overlapping in the direction of drainage is a primary waterproofing concept. a special tool insures complete adhesion at this intersection. ROOFING: the tear off area is being insulated at roof deck and parapet. notice the 2x12 treated lumber wall caps. 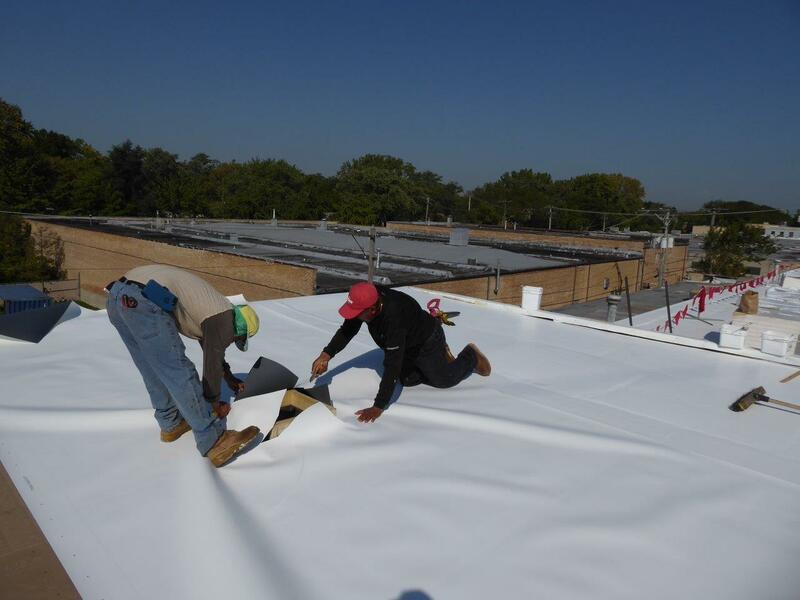 ROOFING: tapered insulation has been installed to insure positive flow to the roof drains. 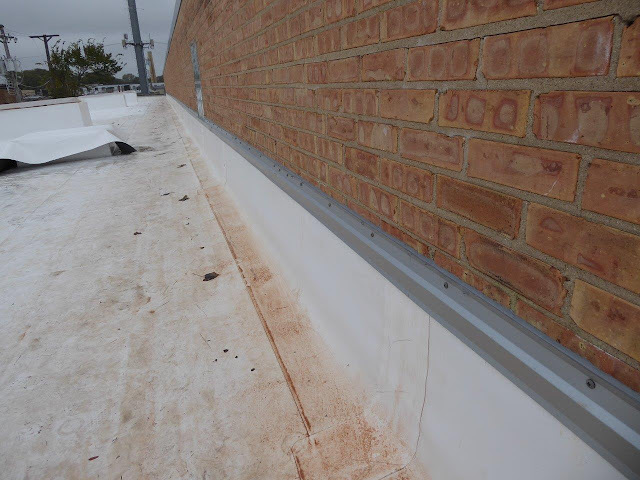 site the edge between the rear parapet/roof deck to see the roof drainage pitch. 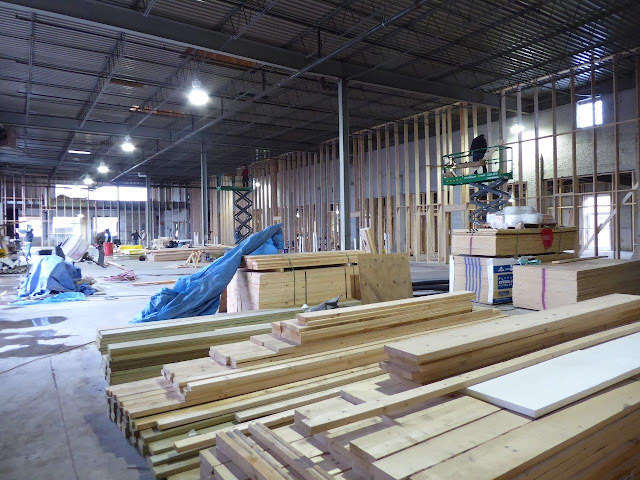 ROOFING: this section is nearly finished. 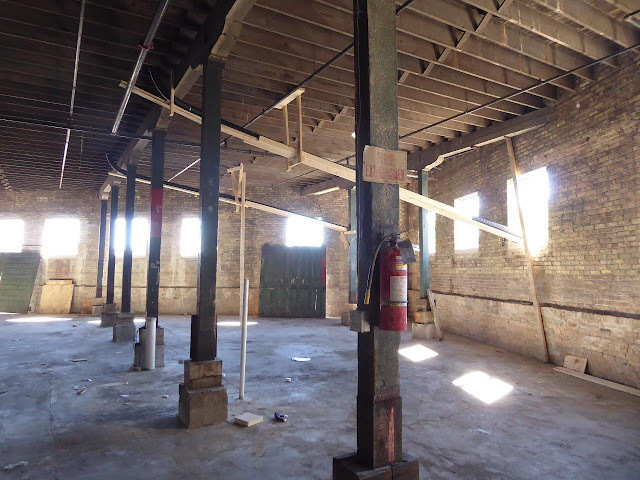 ROOFING: the building adjacent to the 6' wall previously shown has received TPO. the rolling insures a positive contact cement bond between the membrane and insulation. 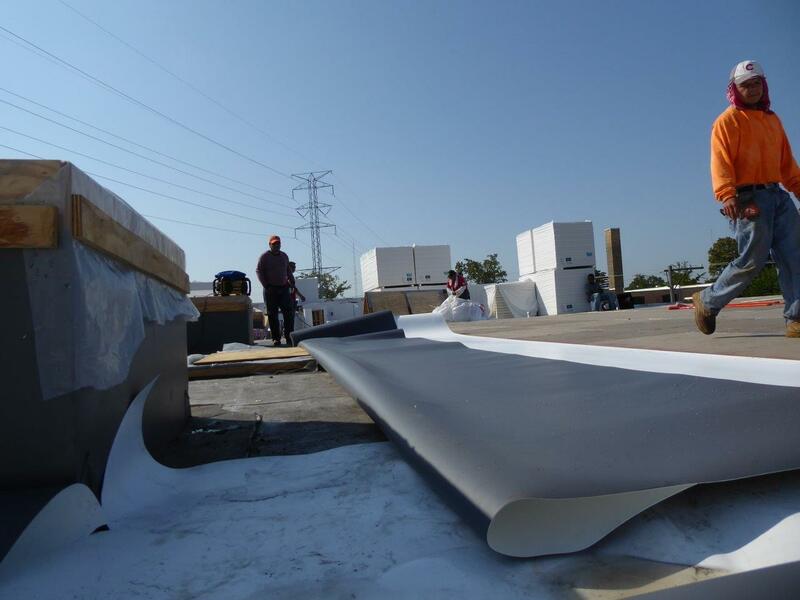 ROOFING: more TPO being readied for gluing. 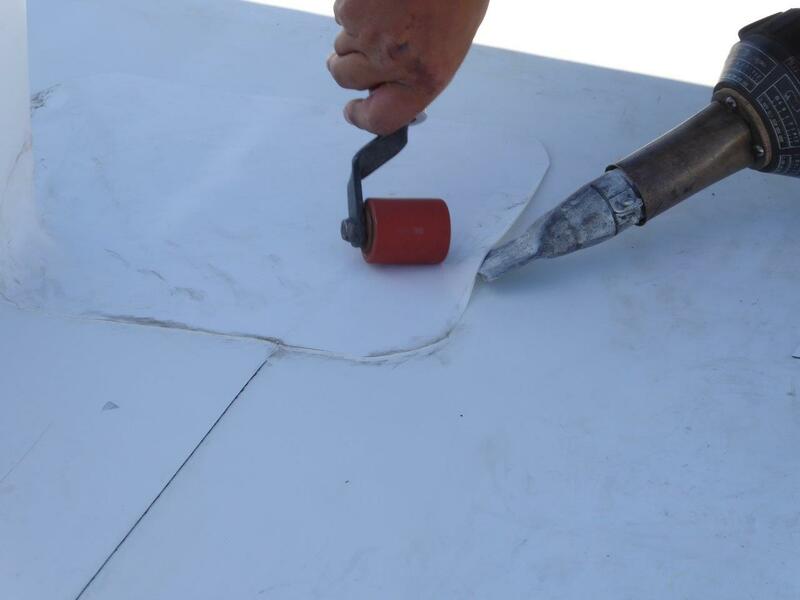 ROOFING: curb cutout prior to adhesive application. ROOFING: insulation installed on last section. 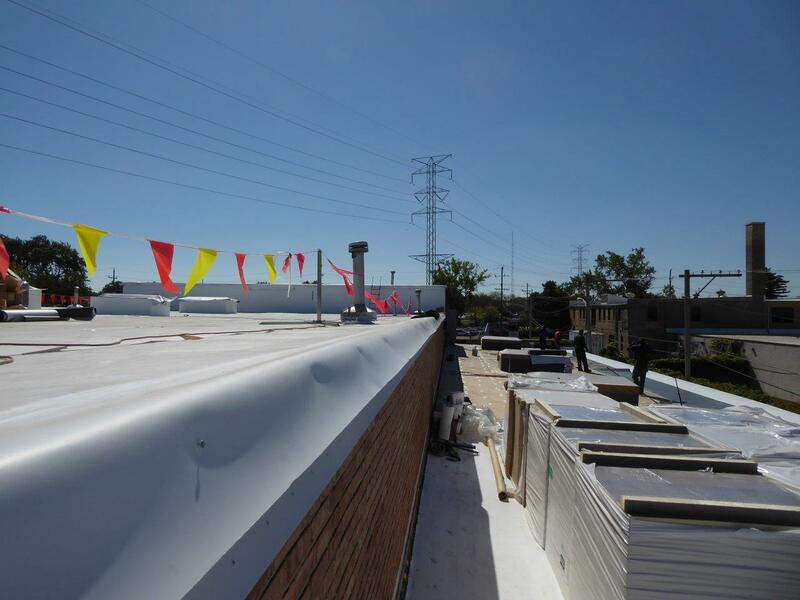 TPO install starting at gutter (low point of roof). 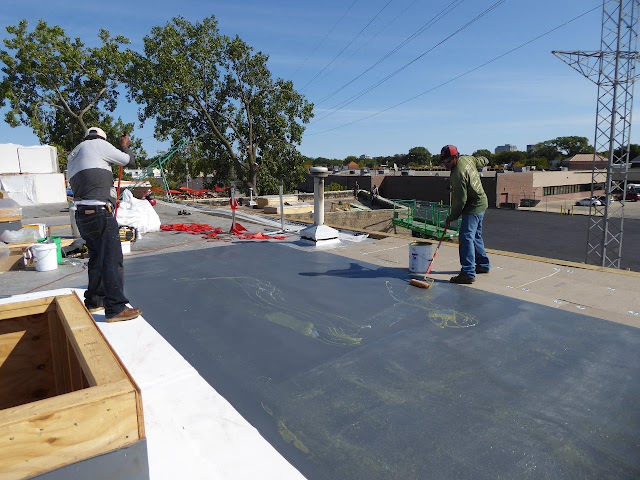 ROOFING: waterproof contact adhesive is being rolled onto the insulation at low point.notice the treated 2x6 wood nailer for the gutter installation is in the upper right hand corner of the pic. ROOFING: the roof edge at the masonry wall is ready for aluminum flashing that finishes the edge. TPO continues on the lower roof. 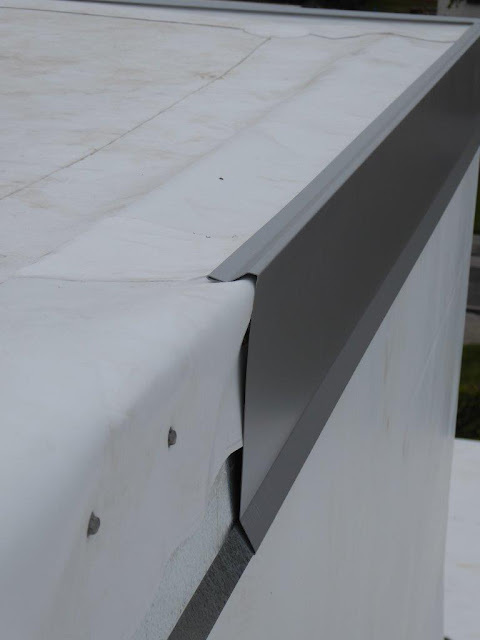 ROOFING: the aluminum L-shaped cap snaps into the sheetmetal below. notice how the TPO membrane overlaps (counterflashes) the sheetmetal. this keeps thing dry. ROOFING: almost done. this skylight curb is being flashed. again, the heat gun is part of the process. 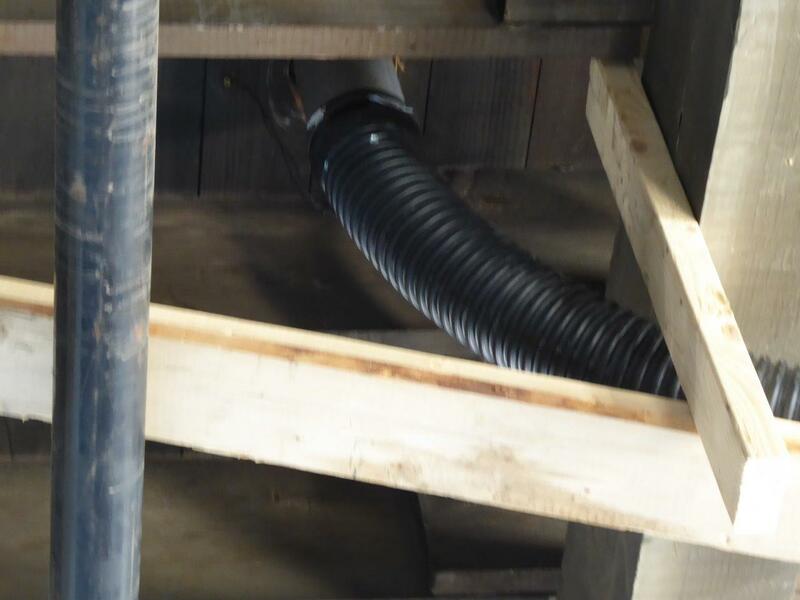 ROOFING: heat gun and roller. 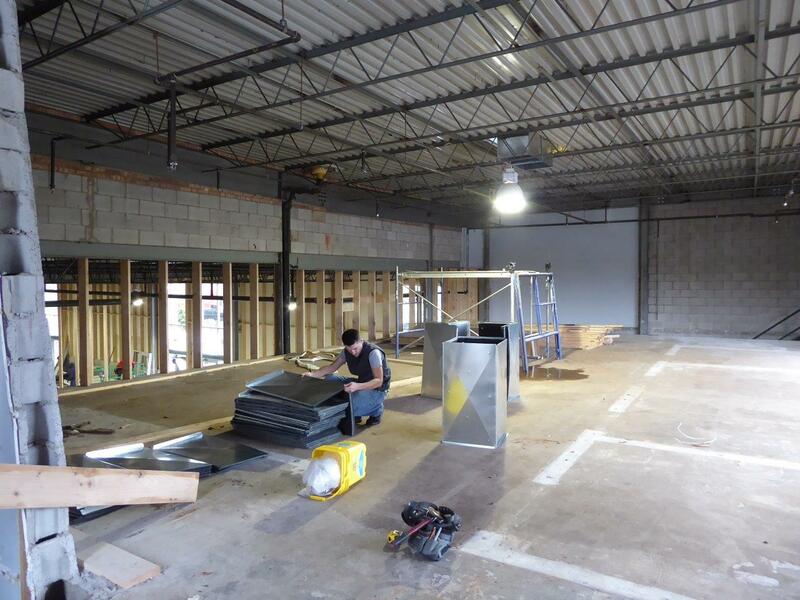 similar process as a sheet vinyl floor installation. 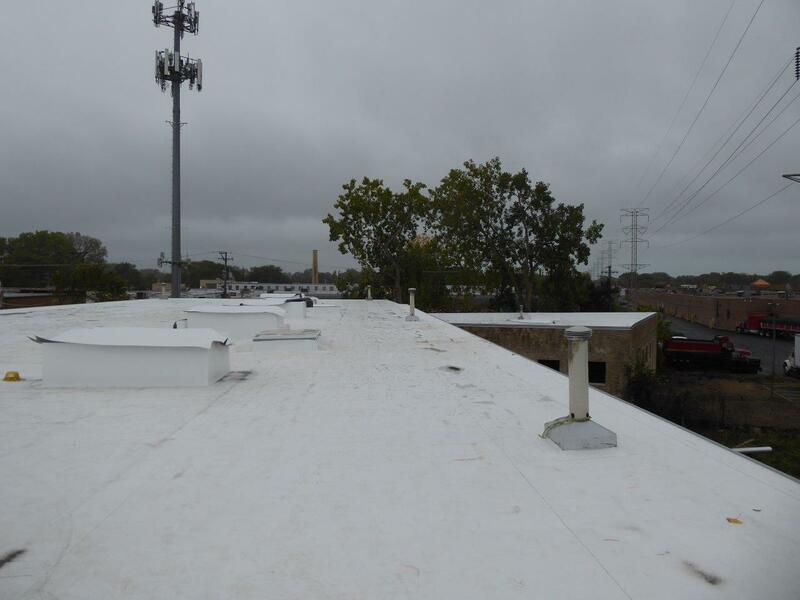 ROOFING: completed for now. 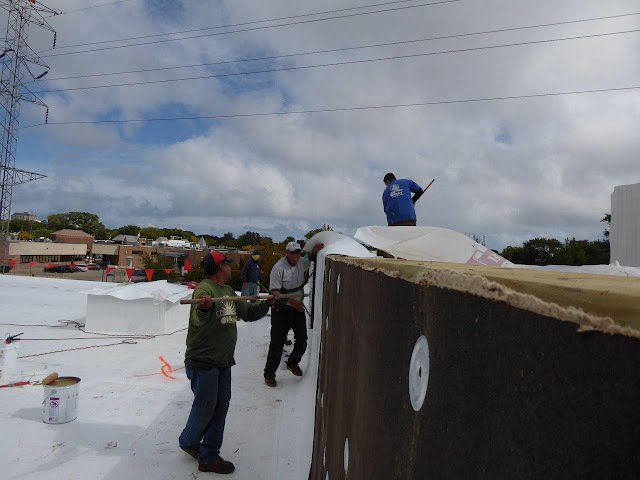 the roofers will be back to waterproof the mechanical trade (PLUMBING, HVAC, ELECTRIC) penetrations. 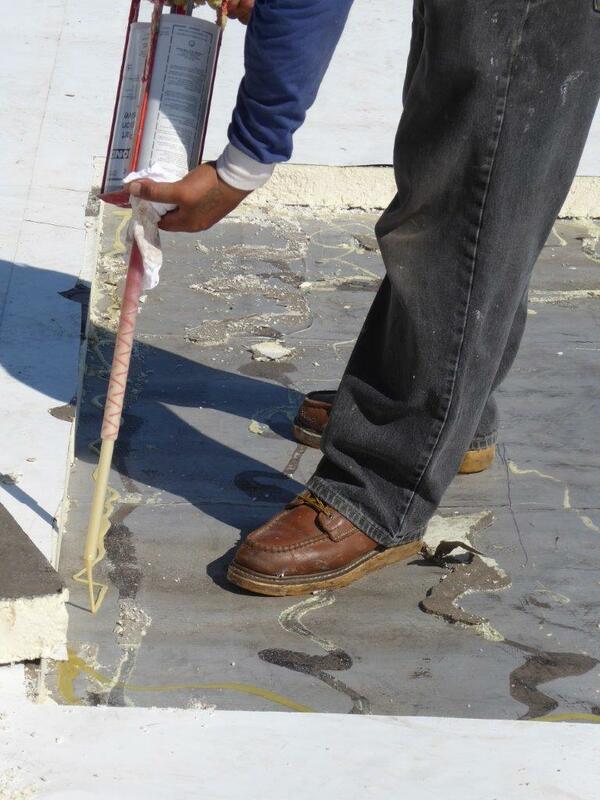 ROOFING: aluminum retention bar counterflashing is mechanically fastened to the masonry. 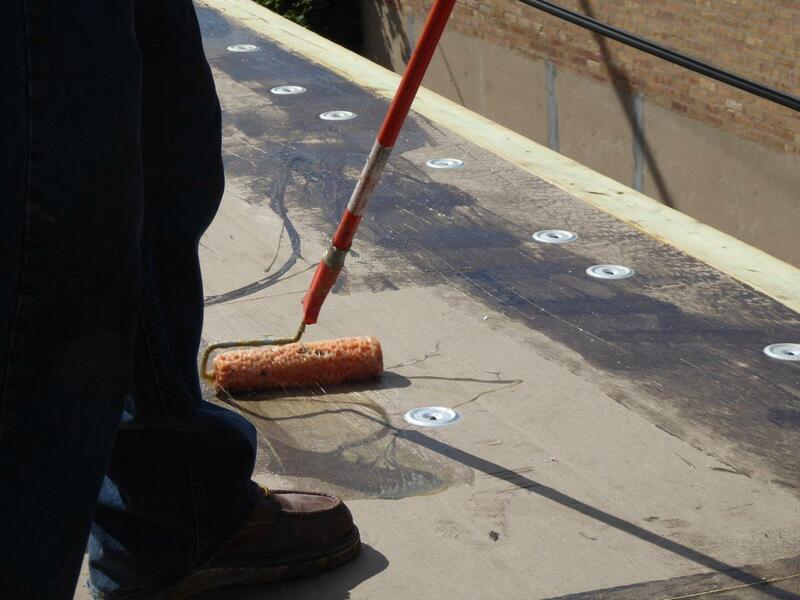 caulking is installed at the aluminum/masonry intersection. 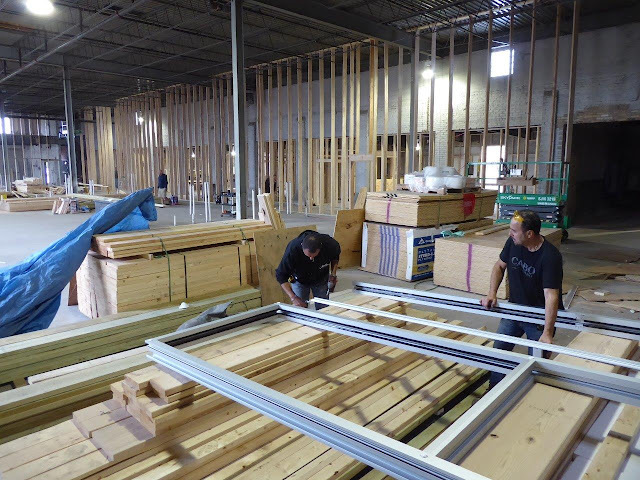 CARPENTRY: tomek is framing the transom which will daylight the bathroom in unit 3. 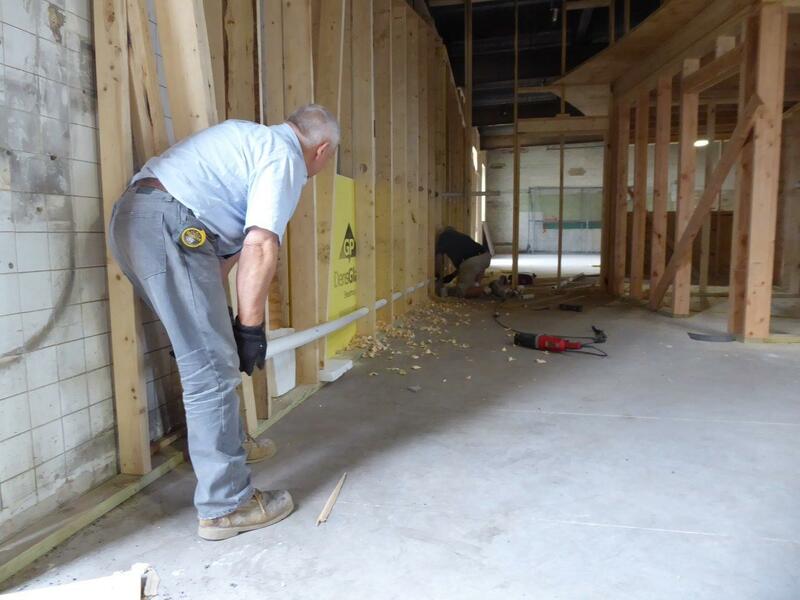 CARPENTRY: marek & tomek are the exterior wall in unit 4. CARPENTRY: the utility corridor is also being framed. 2x8's are used for additional sound insulation and the material is straighter for the longer spans adding to the quality of the end product. CARPENTRY: kris & hubert are installing unit 10 demising wall. 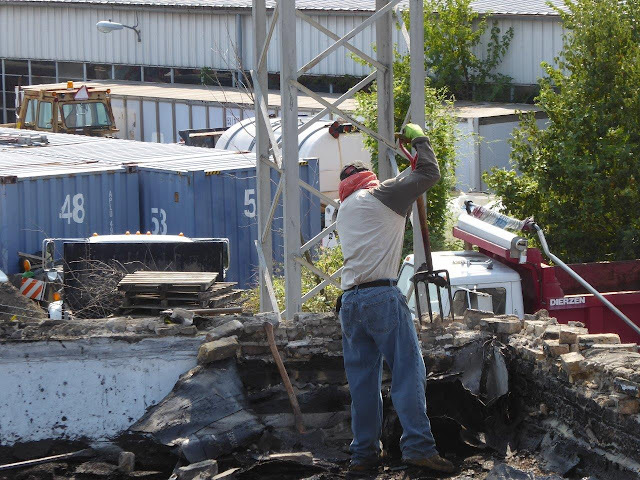 notice the rooftop HVAC unit supply/return drop. 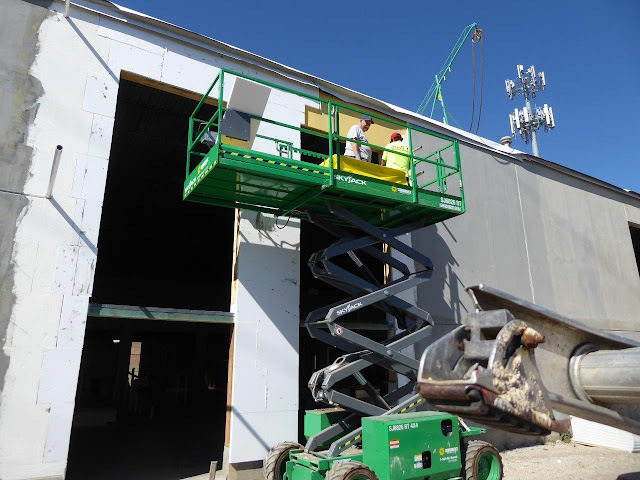 EIFS: jack & geraldo are prepping the opening we left clear for oversized material deliveries...done with that. PLUMBING: 4' flexible pipe was connected to the new roof drains installed in this 2 unit section of the building. 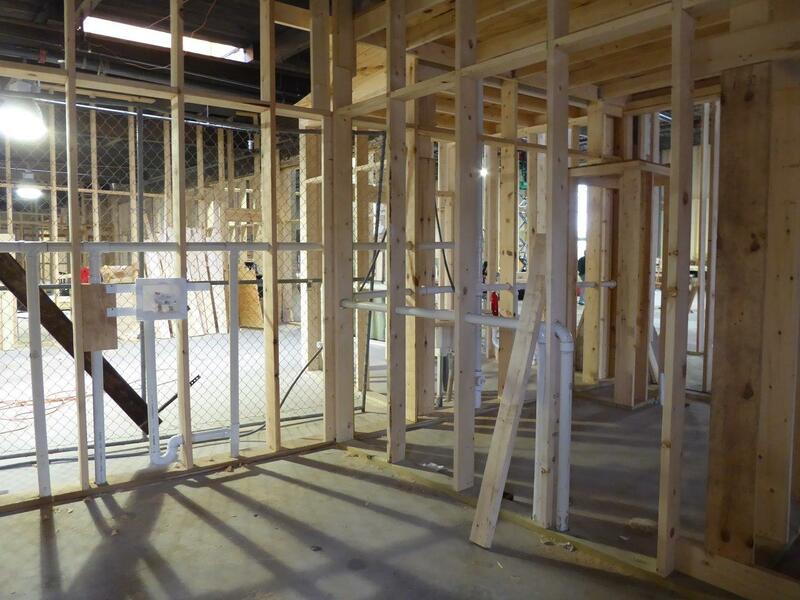 PLUMBING: looks good to matt. PLUMBING: ziggy & janusz are installing a 2" kitchen sink drain line in unit 4...the plumbers are back. PLUMBING: bath & utility room waste and vent complete. 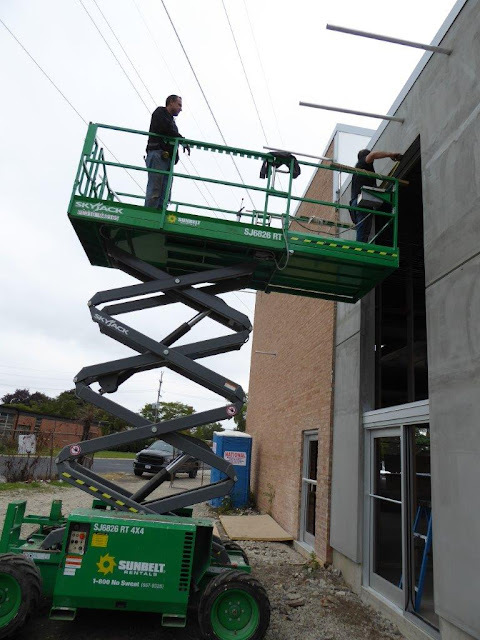 WINDOWS: unit entries and glass frames are being installed on the south elevation.all exterior entry doors are 3'-6" wide as is our usual standard. WINDOWS: nino & roberto are installing the aluminum frames, glazing to follow. 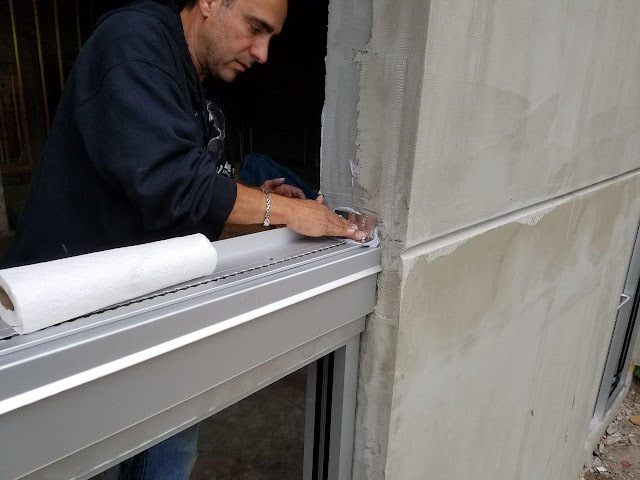 WINDOWS: roberto is installing the side dam portion of the sill pan which is set at the bottom of every window opening to prevent water infiltration. WINDOWS: this entry door assembly was fabricated in reverse. fortunately the system allows reversing. 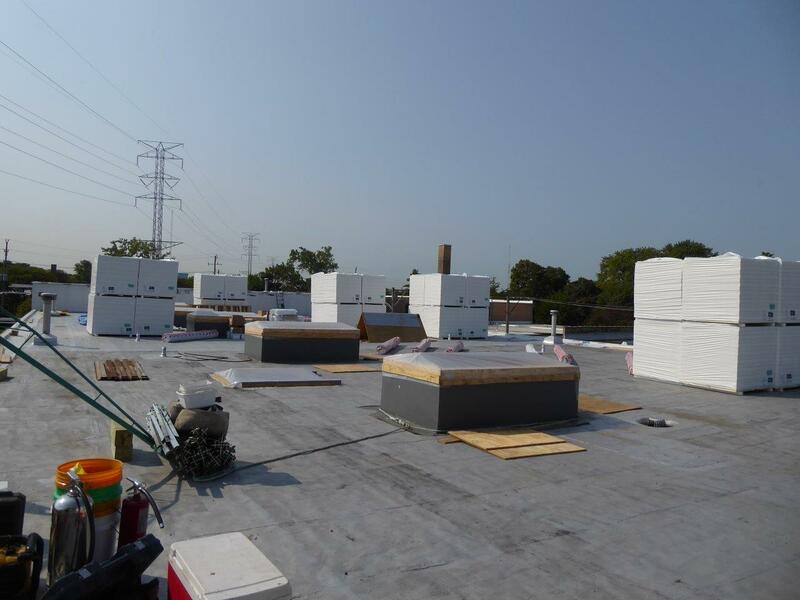 HVAC: rooftop units (RTU) suppy/return drops can be installed now that the RTU curbs are in place.